For most companies, success often hinges on the strategies developed by their business analysts. More and more companies are employing teams of analysts, and job outlook is great for people looking for positions in the field–but that is not to say there won’t be competition. The best way to get a leg up on the competition is with a well-written cover letter, which will dovetail nicely with your resume and give you the opportunity to leave a great first impression on the hiring manager. The sample and industry-specific tips below will have you writing your own in no time, but if you’re short on time, let our state of the art cover letter builder craft one for you in mere minutes. My name is Mitch, and I saw your job posting on Indeed.com last week. I’ve been working as a business analyst for more than 5 years, and I love it. Developing novel business models and forecasts that I can later see put into effect is fulfilling, and [TARGET COMPANY] is well-known in the industry for employing cutting-edge business tactics. I would love to apply my skills and passion for creating innovative strategies to an organization of such repute. One of the most crucial aspects of being a successful business analyst is the ability to make accurate projections and develop strategies that will align with those projections. I’ve worked in such a role for two large companies that demanded extreme accuracy and actionable business plans. My ample experience coupled with my aptitude for creating effective strategies would help me thrive and have a positive impact on the success of [TARGET COMPANY]. [TARGET COMPANY] was recently listed as one of Fortune’s 50 Most Admired Companies. This achievement comes on the back of its expansion into Asian markets. With the increase in market size and revenue, [TARGET COMPANY] will be facing many new challenges regarding trends and strategies. I’ve worked with clients in Hong Kong and Japan in my previous roles, and hope to use what I’ve learned from these experiences to help your company face the challenges ahead and achieve further success. The thought of working for [TARGET COMPANY] thrills me, and I would love to have an opportunity to speak with you face-to-face. I am available any time, Monday to Friday, and can be reached by phone at [PHONE] and email at [EMAIL]. Thank you for your consideration, and I look forward to hearing from you soon. Business analysts are employed in every for-profit industry around the world. Though jobs are abundant, you’ll still need a strong cover letter to get your foot in the door at a great company. Luckily, there are some things you can do to make yours stand out. Stand out to the hiring manager by telling a compelling narrative about why you’re the best candidate for the job. Almost 90% of Fortune 500 companies filter applications using ATS software. To many hiring managers, reading through cover letters and resumes is tedious work. ATS software was created to take some of this burden off of hiring managers. This software scans documents for keywords and phrases that have been designated by the employer. If enough of those keywords have been identified in a given document, the ATS flags it as representing a viable candidate. If not, the application is rejected. Depending on the industry, the responsibilities of business analysts can vary greatly. For this reason, many companies use applicant tracking systems to weed out applicants who have skills that are irrelevant to their particular industry. The good news? It’s relatively easy to format your document in a way that is likely to be accepted by ATS software — simply follow these two steps. First, pull words and phrases from the job posting. If applicable, use them in your cover letter. It may take some rewording or different verbiage, but it will be worth it to score an interview. Next, try to use industry abbreviations and jargon. Many applicant tracking systems scan for this sort of niche vocabulary. For example, if your specialty is data modeling, mention it specifically. Finally, check O*NET Online or even Google for additional information regarding necessary software proficiencies required for the job. Just make sure you read up on these skills to ensure you’re not lying! Almost 90% of Fortune 500 companies filter applications using ATS software. There’s no way to know for sure if your prospective employer does as well, but you can safeguard your cover letter by understanding the tactics utilized by ATS and tailoring your documents accordingly. For more help, check out the section on defeating applicant tracking systems in our ultimate writing guide. 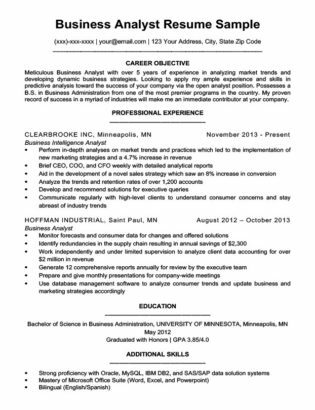 Business analysts are obligated to bring high level analytical skills and attention to detail to their jobs. You can set yourself up for success by demonstrating these qualities in your cover letter. A simple way to do this is by researching your target company. Try to identify the direction in which the company is heading and some issues that may arise along the way. Once you’ve found something, mention it and discuss how you would fit into that schema. Mitch not only mentions the target company’s recent inclusion in a prestigious list but suggests that it had something to do with its expansion into Asia. He goes on to identify some challenges they will face as a result. Finally, he discusses his own experience working with Asian markets, and posits that it would allow him to help the company tackle the new challenges. He comes off as an applicant with strong analytical skills who has done his homework–and importantly, one that understands the business. Your ability to prove your skills and connect with the company could mean the difference between scoring an interview and getting passed up in favor of another. No matter the profession, cover letters should be error-free and easy to read. However, this is especially true for business analysts, who are expected to have great attention to detail and a strong ability to express themselves clearly. When you are finished writing, read it out loud a few times. There shouldn’t be any mistakes. It should also flow very well, with little need for pauses or changes in tone. If you come across some areas that don’t flow well, reword them. In the event that your target company does not use ATS software, the hiring manager will have to read through tens, if not hundreds, of applications. If he or she has trouble reading through any of them, they will likely be discarded. It can be a hassle to reread and reword your cover letter, but if it’s difficult to read, it could cost you the chance for an interview–and ultimately the job. Have someone else read it after you finish. It’s easy to get too close to your own writing and miss some things as a result. That’s all there is to it–but if you still need help, head over to our ultimate writing guide. 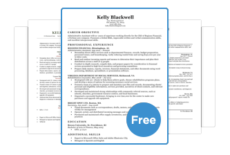 You can also let our quick and easy cover letter builder do the work for you.